#DiverseKidLit: books with multiracial characters. Share a link or find the latest diverse book recommendations here. 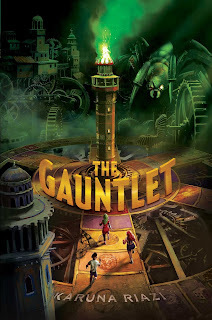 The Gauntlet (2017) by Karuna Riazi, from the new Salaam Reads imprint. I liked this book, but I didn't love it. Which is too bad. Things I did love about the book: I loved the characters, I loved how Farah's Bangladeshi background permeated the story in so many ways, and I loved that this was an #ownvoices author. But I didn't find the plot particularly innovative, and the characters were a bit flat. Full disclosure: in sixth grade I wrote a fantasy story surprisingly similar to the premise of The Gauntlet: a group of four kids discover a mysterious game, the youngest one gets somehow sucked into the game, and the older three have to try and rescue him. (Mine was a magic set gone awry and its "gauntlet" was more inspired by the movie Labyrinth, but still.) But when I went back to revisit this story I was so proud of at the time, it was clear to see that my story suffered from a lack of planning and plotting. I wrote whatever I could come up with and just kept plowing ahead. Unfortunately, for me, The Gauntlet felt quite the same. I had a tough time visualizing how the game itself fit together, the challenges seemed random and unrelated, and it wasn't really building to anything bigger or meaningful. I was waiting for the "aha moment" when loose pieces from everywhere would suddenly snap into place in a meaningful way, but I didn't find it. Would love to hear differing thoughts. I really want to House Arrest, and will definitely get to it when I conquer some of my books on my shelf first. I am glad to hear it was so good. I love novels in verse. Happy reading and travels! Thanks, Alexis! 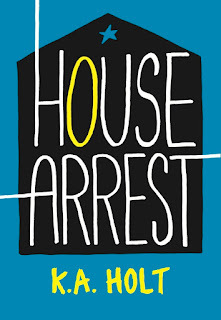 House Arrest is a quick read too, so it should definitely pop up towards the top of your list. House Arrest has been on my list for ages. I even purchased a copy for the school library, but never got around to reading it. As a novel in verse, it goes fast - find a good afternoon and let 'er rip! House Arrest is one of my very favourites. Such a book. I have a reluctant reader reading it right now and he even asked if he could borrow it over the summer!